'Is Stranger Things at its last season?' asked one. Millie Bobby Brown's sob Insta posts have gotten Eleven's fans worried. Stranger Things, the wildly popular sci-fi horror show on Netflix, which was renewed for season three earlier this year, has finally wrapped its shooting schedule. While this may be great news for the bingers, Millie was left in tears over how she could not say goodbye to the rest of the cast and crew. 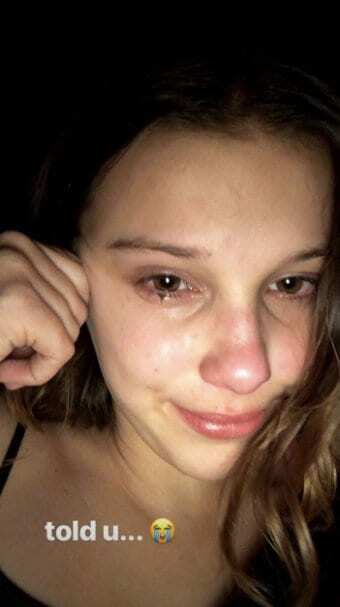 On Tuesday, a visibly upset Millie took to her Instagram and posted a video story about the last day of shooting the season. “I will cry all day fyi,” she informed her 18 million followers. MBB later shared a photo with her show co-star Will (Noah Schnapp) and wrote, "thats a wrap." Naturally, the fans who were eager for the season three were now worried if it is the last season they will get to watch. Soon, MBB's comments section was filled with only one question. "Is Stranger Things at its last season?!" wrote one fan. "Why are they so emotional? They’ll see each other again isn’t there a season four?" wrote another. "I don’t want stranger things to end." "Hope there is an s4 can’t wait till s3 comes out." Speculations of Stranger Things ending hit overdrive when Chief Hopper (David Harbour) got rid of his moustache. "Wrapped. Everyone say ‘goodbye mustache.’ If you need any info on what’s good in Hawkins while I’m away, give Gary a call. He can’t keep his damn mouth shut." Turns out, the 14-year-old Millie may just be sad about season three getting wrapped up. As Refinery29 points out, a tweet posted by Netflix US earlier this year, shows a different story altogether. "Don't drop your Eggos. Rumors that the Duffer Bros are leaving Stranger Things after season 3 are false." Meanwhile, Netflix recently celebrated the first 'Stranger Things Day' on November 6. The series is created by The Duffer Brothers, who also directed episodes, along with Shawn Levy. It stars Winona Ryder, David Harbour, Finn Wolfhard, Noah Schnapp, Millie Bobby Brown, Caleb McLaughlin, Gaten Matarazzo, Natalia Dyer, Charlie Heaton, Joe Keery and others. They will be joined by Little Women actor Maya Hawke, who will star as a girl bored with her day job and looking for excitement, and The Predator star Jake Busey in the new season. The series takes place in the fictional town of Hawkins, Indiana, where a secret government lab accidentally opens a door to another dimension, referred to as the Upside Down.